Justice has been served, albeit belatedly, as cartoonist and entertainer Rolf Harris has been convicted in a British court of 12 counts of indecent assault going back decades and involving numerous minors. His victims include a friend of his daughter, who he sexually assaulted from the time she was 13 until she was 19. Harris was arrested along with several other media personalities, including Gary Glitter, for questioning in March, 2013 as part of Operation Yewtree, the investigation that ultimately uncovered numerous instances of child sexual abuse by British television presenter Jimmy Savile. Harris wasn't charged at the time, but evidence collected during the investigation of uncovered unrelated allegations of sexual assault against Him. He strenuously denied any wrongdoing, but was arrested again in August, 2013 on charges of abuse that occurred during the 1980s. As the investigation went on, more victims came forward. Found guilty today, he will be sentenced on Friday. Though relatively unknown in the US, Harris is famous in the UK and Australia for a career spanning decades as an actor, musician and television personality. Originally from Perth, Australia, he's also an artist who has hosted numerous tv shows based around his cartooning. 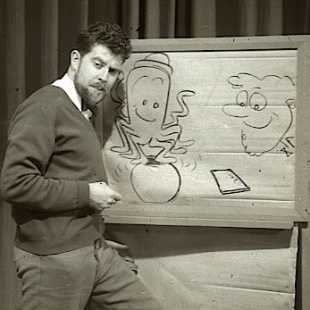 Among the characters he created is Oliver Polip the Octopus, pictured above. Most recently, he hosted a BBC series called Rolf on Art, which aired on a recurring basis from 2001 to 2011. A special episode of the series broadcast in 2006 featured his creation of a commissioned impressionist portrait of Queen Elizabeth. No word on how Her Majesty feels about the painting in light of today's events.